"I used this recipe a great deal because it was so easy and good. It originally came from my grandma's 1950s recipe collection." Heat a large skillet over medium-high heat. Cook and stir beef in the hot skillet until browned and crumbly, 7 to 10 minutes; drain and discard grease. Return skillet and beef to stove and reduce heat to medium-low. Stir chili sauce, mustard, brown sugar, and vinegar into the ground beef; simmer until the sauce thickens, 5 to 10 minutes. If desired, you can also saute 1/4 cup diced onions and 1/4 cup diced green peppers until tender before adding the ground beef. 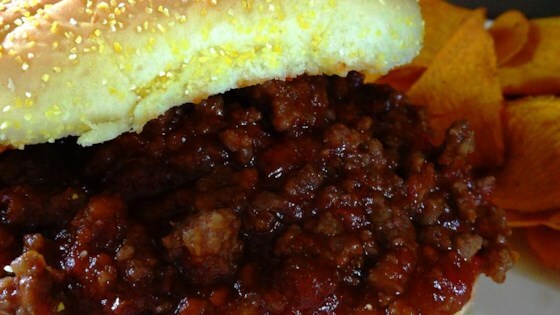 I made this it was so good I did not add mustard but I did brown sliced onion to put on top of bun before adding sloppy joes for those who do not like onions. It wasn't too bad. My husband didn't like it at all. Not sure what he didn't like. This is my second time making this- first time it was too spicy but used regular chili sauce and it turned out so delicious! Even my picky nephew had seconds so this must have been good! Loved how easy these were to make. I sauteed some chopped onion before browning the ground beef. This is the recipe my mother always used, so it's my favorite. Had no 'Chili Sauce' on hand so subbed in Sriracha Ketchup and wow this was good, sweet and just the right level of spicy kick for everyone.